PhD student exhibits her Mars Rover at Farnborough Air Show. 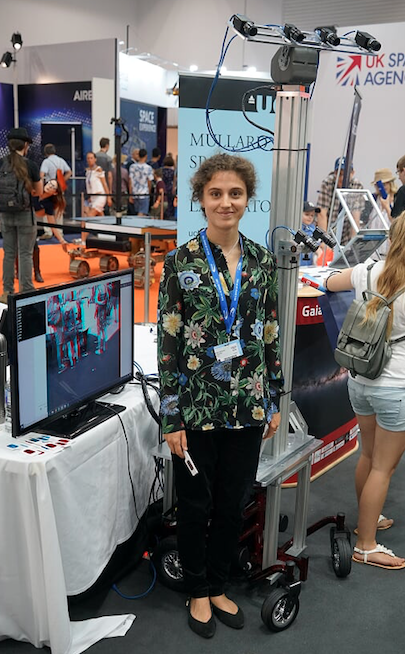 CDT PhD student Eleni Bohacek recently exhibited her experimental Mars Rover that she has been building based on a disability scooter at the internationally famous Farnborough Air Show. Eleni is a student of the UCL-Cambridge Centre for Doctoral Training (CDT) in Integrated Photonic and Electronic Systems (IPES). Eleni loves to design instrumentation for space and her second supervisor Professor Andrew Coates is based in UCL’s Mullard Space Lab so Eleni can gain interdisciplinary expertise for her PhD working alongside her main supervisor Dr David Selviah from the EEE department. She has enjoyed developing computer vision systems for the Rover.